Hey! Welcome to another Monday Montage Blog Hop! I'm excited to share this card with you today. I need to send out some thank you cards, so I pulled out one of my favorite stamp sets to make this gorgeous card. I started making this card with a few other colors, but decided that Blackberry Bliss and Gold was perfect for an elegant fall card. 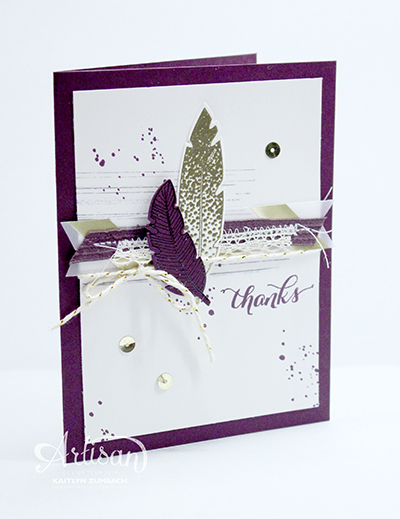 The "thanks" from Another Thank You pairs beautifully with the Four Feathers stamp set. A little bit of Gorgeous Grunge add some interest and fun to the card. What makes this card really special is all those layers. 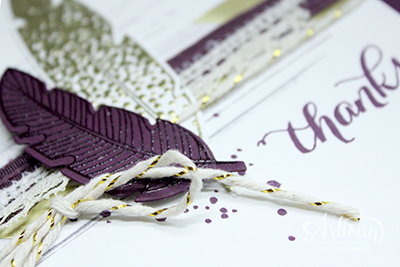 Some Gold Foil Vellum, Blackberry Bliss Ribbon, Venetian Crochet Trim, stitching, and Gold Baker's Twine all work together to bring this card over the top. The feathers are also heat embossed, in clear and gold, to add some shine and extra love. I know everyone else has something great to share with you, so hit the next button to check it out! Gorgeous is correct!!! I love the Blackberry Bliss and gold...stunning! OOoo, I love all the layers. Those ribbons are gorgeous! What a fantastic card!! REALLY beautiful w/ the Blackberry Bliss & gold. So, so many of my friends love purple and that card would be just perfect for them. And you know what? I was not interested in the feather stamp or die, didn't think they were "my style," didn't consider getting them....(sigh). I think this card changed my mind :). It's inspiring and I'm already seeing a few different projects I can create. Thanks, Kaitlyn!